When it comes to downloading the high quality and cool looking wallpapers for Android, there aren’t many good options available. Not just for android, for any platform/device, you will have a hard time finding the appropriate and quality background images. Of course, you could always go on the web to dig out some of the finest looking wallpapers. However, most of the times, you would end up spending a lot of time than you’ve actually expected. Well, not everyone is patient enough and not everyone has the time to spend on such things. If you’re also one of them, then don’t worry, you’ve landed in the right place. 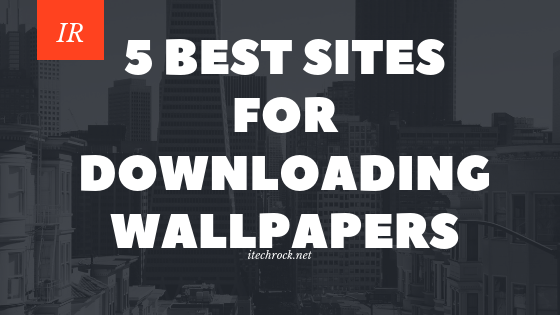 Today, in this article, we’ll be sharing our list of top best sites to download wallpapers. You will be able to easily download background images for any device such as Android, Desktop, Laptops, Tablets etc. These sites will provide you wallpapers in various genres ranging from abstract to artistically formatted images. You don’t have to spend your time anymore looking for a reliable wallpaper downloading site. Just go to the below-mentioned sites and pick your genre to quickly find stunning HD background images. So, the first spot on this list of Best wallpaper downloading sites goes to WallpapersWide simply because the number of wallpapers they have in every category. The best part about this site is that you don’t have to waste your time in Registration or sign up. In fact, you could download the wallpapers right away without any hiccups. There’s a huge list of categories placed on the left side, so you could jump from one category to another anytime with just one click. The download process is also quite simple, you just have to select the image size and the type of device i.e Smartphone or Laptop to download the image. That’s all! Wallpapers Stock is another well-known site to download HD background images for free of cost. The site doesn’t include or force you to pay any fees or have any kind of subscription to download the wallpapers. You can actually download as many wallpapers as you want from every category without any restrictions. The site shows you wallpapers based on the resolution you’ve chosen upon landing. Once the images are loaded, you can take your time to pick the best and download them with just one click. Just like the former site, you don’t need to create your account on this site as well to download the wallpapers. If you’re fine with spending little extra time creating your account, filling up additional details, then make sure to check out Vladstudio. They have got a wide range of categories, each of them includes over a million wallpapers to browse and pick. In case, if you were looking for beautifully graphic wallpapers, then look no further. Vladstudio has got your back, just head over to the site, create your free account and you’re all set to download the visually stunning HD background wallpapers for your device. The site includes both free and paid artworks as well. The free version would be more than enough for the most part, but you can try out the paid version for free up to 7 days if you want to explore further. Desktop Nexus is a community platform where people from all over the world share their best clicks and snaps. It’s a good place to check out if you’re looking for nature and realistic wallpapers. Of course, you’d find some low-quality images as well during your search, however, the images being placed in an organized and orderly manner makes it simple to find the best wallpaper image. The best part is that you don’t have to waste your time in selecting the size or resolution. The site will automatically resize the image to fit your desktop screen. It’s more than just an ordinary wallpaper downloading site, and all of that comes for free of cost. As the name itself suggests, it’s a community-backed platform where thousands of artists from all around the world upload their work. DeviantArt is an ideal option to download wallpapers for those who are very much into anime and fantasy stuff. Most of the stuff that you would find on this site are original and unique in their own ways. In fact, the process of picking the best wallpaper for your desktop screen could be a hectic task, simply the number of wallpapers available on the site that are beyond perfect. The only downside is that you would have to spend some extra time during sign up as the process is a bit long. But, once it’s done, things will become quite easy and simple for you.